"Recently I sent shock waves through the political establishment by announcing Amnesty 2000--a plan that would free all 'grown ups' from prison who have learned from their past mistakes, like I have learned from mine. Gov. 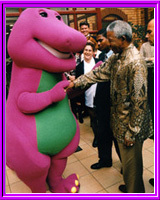 Bush has asked Nelson Mandela to assist in establishing a Truth Commission to discover who needs to be let out of jail. then. We've been analyzing the data from his first attempts. And now we think we've "worked out the bugs" and learned enough to make sure that Amnesty 2000 unfolds without a hitch. "Here's the story of Dad's first Amnesty plan: He knew he wanted to make a big splash with it, so he pardoned a very high-profile convict. Looking back it's easy to see that his particular choice of convict may not have been the best. But hindsight is always 20/20 vision, isn't it! "Aslam Adam had been caught with 1.5 million dollars worth of heroin that had been smuggled into the country from Pakistan. He had served 8 years of his 55 year sentence when Dad signed the pardon that let him free. What a bold move! And just two days before he left office and political life forever! It was a noble but flawed first try, and Dad should be commended for taking such a huge political risk--all for just one man's life. Innocent but found guilty in a joke of a trial, like Dorothy Gains and the Tucker family. People who committed a crime worthy of a short sentence, parole, or treatment, but who are serving for decades or even life, like Joey Settembrino and Calrence Aaron. "A 'Truth Commission' will be established, based on the South African model, to locate innocent people who are serving in prison, and minor offenders with outrageous sentences. The Truth Commission will enlist the aide of thousands of social workers who will be trained and hired through Americorps. "We will request assistance from workers from the very successful South African Truth Commission and possibly also the Guatemalan Truth Commission, once they are done with their important work. Nelson Mandela, you know, is an old friend of the family, and he has already assured me, now that he has retired from public office in South Africa, that he would love to come and assist us in ending our own dastardly version of apartheid." Volunteers for the Amnesty 2000 Truth Commission are encouraged to contact GWBush.com. Also, if you'd like to suggest cases for the Truth Commission to examine, please send a synopsis of the details.